Add all the other ingredients and smash with a potato masher or other handy utensil. Mix well. 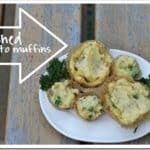 Put a big spoonful of potatoes into each large muffin cup, and add a scoop of frozen peas, then top with more potatoes. They won’t change shape, so fill the cups as much as you wish. For mini muffins, you probably want to stir the peas right in since they’re a bit too small for hide-and-seek peas. Bake at 375F for 40 minutes, 15-20 minutes for mini muffins. Makes about 10-12 muffins or 24 minis.